I’ve been there. You’re so hungry you can’t think straight, but you’re stuck at your desk. Either you don’t have any break time left or your schedule is so jam-packed you literally cannot sneak away from your desk for even five minutes to grab something nearby. Not to mention if you’re working at an office where the nearest snack is a 30 minute there-and-back-drive. Forget about it. If you’re like me, you don’t like to be hungry. So what do busy people do when they don’t want to run into situations where they have to go hungry? They stay prepared. 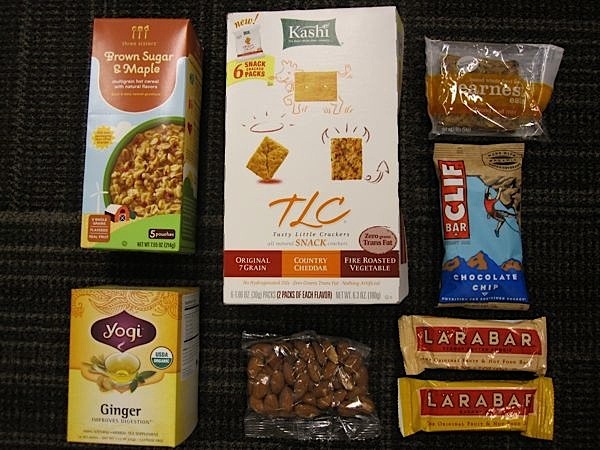 The best way to combat office hunger is to keep a stash of your favorite snacks at your desk. There are plenty of good non-perishable options, many of which will last quite some time in your desk drawer waiting for that moment you need it. Snack bars – they usually have extremely long shelf lifes and come in a variety of flavors and types – full of vitamins, full of protein, full of whatever you want. I like to keep bars in a variety of sizes so I can use whichever best fits my hunger level. Bars are great, too, because unlike dried fruit and nuts that go bad relatively quickly, bars typically last for quite awhile. There are tons and tons of brands of bars out there, so just pick up a couple and experiment. I like to look for bars with short ingredient lists (yay clean food!) or vitamins-added (yay energy!). Organic Food Bar – love the flavor and texture. Bar does have a long ingredient list, but they’re pretty much all read food. Vega Energy Bar – wonderful ingredients and I really like the Vega brand (I even met Brendan Brazier once!). KIND Bars – great source of nuts and nice crunchy texture. Clif Kid Zbars – great for when you want just a little something, plus they have some vitamins. Clif Bar – full of vitamins, almost meal-sized (calorie-wise). They taste a little chalky but have pretty good flavors overall. In times of need, they can serve as meal replacements. Nuts – they make for a great source of protein, which will help you stay full and will give you longer-lasting energy. I also like that they’re a non-sweet snack since most snacks seem to be on the sweeter side. My fave snacking nuts are: almonds, cashews, Brazilian, and nut-mixes. You can purchase them in individual portions at Trader Joe’s for convenience and so they last longer. Crackers – they make for a great carb snack. Now listen, I’m not a no-carb or even low-carb type of person. I love carbs! If you’re on a no/low carb diet, this snack won’t work for you. If you’re like me and you like carbs, I recommend choosing the ones that provide whole grain servings. Crackers can also help fill out a meal if, for example, you bring a small sandwich or soup to work and need a little something else to fill out the meal. I really like the Kashi TCL crackers (the Honey Sesame…yum!) for the ingredients and flavor options. I like to store my crackers in air tight containers or even better, purchase them in individual packets. Oatmeal – this item will serve double-duty for you – breakfast for days you skip it or miss it at home or a comforting snack. Oatmeal is a healthful whole grain. You can purchase individual packets that you only have to add hot water to. I used to eat those all the time because they’re so darn convenient. Now, if I have the option, I prefer the microwavable kind because they’re less processed than the instant version. Quaker Oats and Kashi make great instant oatmeal options – the kind you just add hot water to. For a not-quite-as-convenient but more healthful option, Three Sisters offers oatmeal with great ingredients like flaxseed. I believe Trader Joe’s also has some nice oatmeal options, but I haven’t tried them. I typically like the foods at TJ’s, though, so I’d probably like them. Tea – Ok, it’s not a “snack,” but I do like to keep some of my favorite teas at my desk, and I usually store them with my office snacks. Most offices have water coolers with a hot water option, so you can just add the hot water to your tea bag and sweeten, if you’d like. Of course, the microwave is always an option to get your hands on hot water. Which reminds me…sometimes I keep honey in my desk because I find most offices only have sugar and fake-sweeteners. 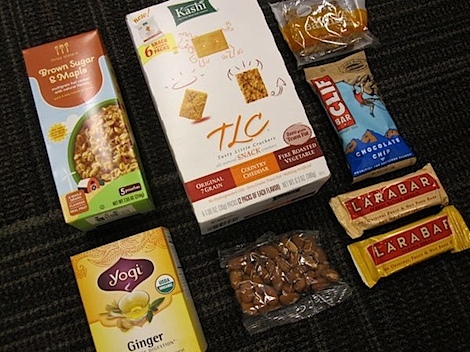 What are your favorite office snacks? « Chocolate Pumpkin Oats + Share TCL! great post! i try to bring snacks to work every day, but i should really try keeping a stash here! hope to see more posts like this! I always had almonds and cashews also… and if I ran out, the main Doc always had some to share! I love having Luna bars and Clif bars at work! I love the ingredient list of Larabars, and I do buy them, but I have yet to develop an actual real taste for them. I often get trail mix because I find it staves the hunger off for longer. I am planning to make a batch of my own trail mix to bring to work instead of getting the cafeteria kind. Excellent post! I always keep nut butter (like 3-4 jars), a bag of whole wheat english muffins, lots of granola bars, crackers, tea, oatmeal (clearly we have similar eating habits) and dry cereal/granola for yogurt/oatmeal mixins. If I don’t bring snacks with me to work I’m in big trouble! Either I buy something not-very-healthy out of desperation or I buy something really expensive. I try to keep some bars around, and once in a while I will bring a big bag of baby carrots and a tub of hummus to keep in the work fridge. I also love the mini bags of popcorn as a filling snack! I keep a jar of peanut butter in my desk, crackers, various teas, Fiber One or some kind of granola bars. I try to find the ones that have 4 grams of fat or lower (the lower the better for me). When I was doing Weight Watchers, I’d buy their One Point Bars and keep some of those at work too. Oh and instant oatmeal. Sometimes I never touch these snacks but its good to know I have them just in case. Also, gum and mints too for a quick breath freshener. I love Three Sisters Dark Chocolate oatmeal! I keep that in my desk. I don’t have a lot of room so I usually bring snacks, but I do have a snack bar drawer. I really enjoy Kashi Dark Chocolate coconut bars. I have Kashi TLC Cereal Bars and Sunflower Seeds stashed in my desk! great post! I keep the mini cliff bars at my desk along with oatmeal and almonds. I also keep some canned fruit! This is a great post. When I worked in the office, I would stop at the supermarket on Monday AM before going into work and buy 5 pieces of fruit to leave at my desk for the entire week. Great post! Where’s the string cheese baby? Hehehe – Love the idea of having peanut butter around – mmmmmm – goes well with apples & crackers 😉 I’ve also been doing plan yogurt, berries & good (low sugar) cereal and/or nuts. So delish – it’s like a dessert! I NEVER leave home without a bar in my purse/bag. I don’t eat them often, but knowing that I have a quick and healthy snack for ‘dire situations’ keeps me from reaching for a candy bar! Awesome suggestions! I’m all about the Clif Bars and the almonds, although I know that for me, knowing that I have food on hand just for munching (not necessarily for a meal) is pretty much asking to break into it whether or not I’m hungry, and I find myself making up excuses to hack into it – especially with things I love, like Clifs! I love to bring homemade trail mix with me! On any given day I have most of the staples you mentioned at my desk. Stopped bringing in homemade trail mix though because I couldn’t stop devouring it by the bag when I wasn’t even hungry. Too good. Another non-perishable item I always stock for lunches is canned soup, preferably reduced sodium. Progresso’s Italian-Style Vegetable is a favorite! Great suggestions! I like to keep almonds in my desk, or some sort of trail mix. Right now I am loving the “Wasabi Wow” mix from TJs- so good! I’m a big fan of the mini-bags of popcorn as well. My desk snack drawer is constantly changing but most recently I found sound Blue Almond Salt n Vinegar almonds! Whenever a co-worker comes in with a bag of chips I reach for these for a healthier alternative. Thanks for including our natural oatmeal as a great snack idea. There is nothing worst than being hungry… and oatmeal can be very filling.